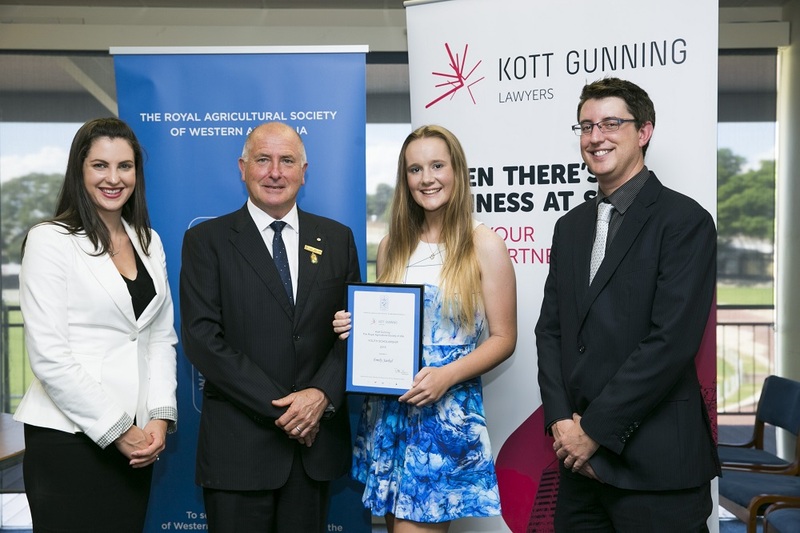 Leading West Australian law firm Kott Gunning in partnership with the Royal Agricultural Society of WA has established a scholarship for young Western Australians studying at university for a future career in the agricultural industry. The inaugural scholarship has been awarded to Emily Jaekel, a high achiever who graduated from the WA College of Agriculture Cunderdin last year. The President of the RAS, Dr Rob Wilson, said the calibre of the applicants for the scholarship was impressive. “We are delighted to be involved with the RAS scholarship program as there is high demand for talented and skilled people in so many agricultural sectors,” he said. Scholarship winner Emily is studying a Bachelor of Rural Science online from the University of New England in northern NSW. She spent a week there when along with 99 other young Australians she was selected to participate in Generation 2050, a project to find solutions to feeding the world’s population by the middle of the century. As the recipient of the 2014 ABC Heywire Award, Emily spoke to parliamentarians in Canberra about the value of integrating agricultural studies into primary schools. Emily is the fifth generation of her family to farm a 12,000 acre broad acre cropping and sheep property at Ongerup in the Great Southern region of WA. Dr Wilson said it was as a result of the support of Kott Gunning that the RAS was able to provide the tertiary scholarship as part to its Rural Leaders program which also offers scholarships to high school students at WA’s agricultural colleges and recognises regional leaders through the Rural Ambassador and Rural Community Achiever awards. Last year the RAS announced it would establish an Education Foundation with the goal of securing $1 million for educational scholarships by 2016. Dr Wilson said that education was a core objective of the RAS and that the Perth Royal Show would be expanding its agricultural education platform in 2015 to incorporate new exhibits while the FarmED program, now in its fifth year, will visit 50 primary schools this year to teach children about the importance of agriculture and where their food comes from. For more information about this scholarship and the Educational Foundation please contact Maryanne Shaddick of RAS on 08 6263 3181. Image caption: Kott Gunning’s Josephine Hart (L) and Tim Lethbridge (R) with student Emily Jaekel and RAS President, Dr Rob Wilson in middle.